Pick up from your Hotel or Guest House in Chiang Mai, Thailand by our english speaking tour guide(s). 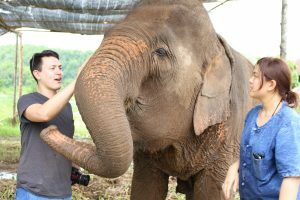 The guide will casually talk with you about the elephants and what you will be doing as well as answer any question you have about the local culture, best restaurants, etc. 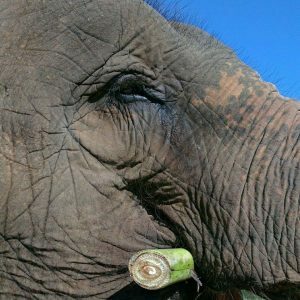 Arrive to the Chiang Mai Elephant Camp or Elephant Farm, change clothes, start the introduction to basic training on how to be a Mahout. 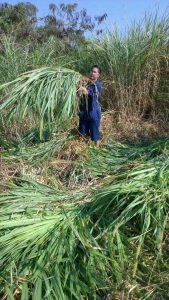 Learn and practic basic commands in Karen (Thai Hill Tribe) language to order or command the elephant. 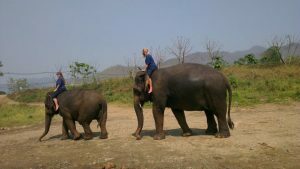 Take a Ride on your elephant bare back like a mahout would around the Chiangmai Elephant Camp area. 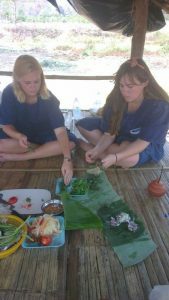 Have a great time having eating traditional Lanna or Northern Thai food as a mahout would. This meal is prepared by our mother Aumara Panyamoon. This maybe one of the highlights of your trip! Start to control the elephant and ride your Asian Elephant on bare back to the river to bath your White Elephant, every elephant loves to play in the water, so you are sure to get wet. 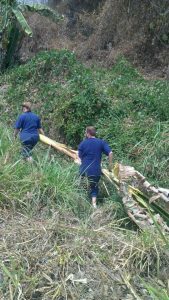 Take a bamboo rafting trip down the Maewang river for aprox. 40 minutes and enjoy the cool natural water and jungle scenery. 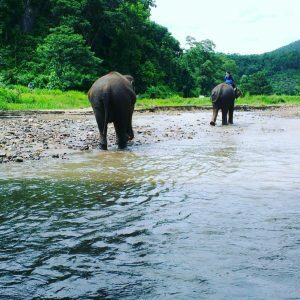 You will enjoy the cool water after your day out in the Sun during your Elephant Mahout Traing Course. 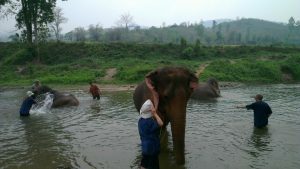 Return to Chiangmai, Thailand safe and sound after your experience with Chiang Mai Elephant Tours. We base the time we take you back to Chiang Mai on when you are ready up until 4:00 pm so if you want to go back to Chaing Mai early that is up to you. Please state which tour you would like to take, how many people will be in your group and how many days. We will get back to you as soon as possible to confirm your reservation. We accept PayPal secure payments which are backed by the largest banking network in the world & you have free buyer protection to guarantee your money is safe.